Brendan Duffy is a Lecturer in Applied Geoscience in the School of Earth Sciences at the University of Melbourne. He is a committed geoscience teacher and an active researcher who publishes articles that integrate structural geology, geophysics and geomorphology. 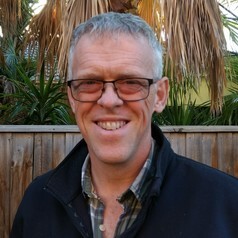 His interests range across subjects from the tectonics of Eastern Indonesia to the active tectonics, earthquake geology and engineering geology of the South Island of New Zealand. Brendan grew up on the Zimbabwe Craton, leaving as a young adult to spend eight years in the British Army. He later turned towards geology, his interest piqued by tours of duty in Bosnia, Italy, Cyprus and Kenya, as well as by post-military travel in the great parks of the United States. Brendan was awarded his PhD in 2013, and has published regularly since then. He has also spent some time working in industry, on projects ranging from gold exploration in Northern Queensland to water exploration in New Zealand. At The University of Melbourne, Brendan teaches engineering geology, coordinates the professional masters program and oversees the Timor-Leste geological and geohazard mapping programme.